The short walk to the water is a winding path of soft sand, stubborn plants, grumpy iguanas and structures far beyond their glory days. When I actually come to the sea, all that’s left is a leaning, rotted wood post with a caught tattered, sun faded blue cloth gently swaying in the breeze. It’s eerily quiet and I can’t help but think the world has just stopped. Several small buildings and boats line the white sand beach ahead of me but I see not a soul and hear only weak surf and the sand crunching beneath my feet. The intense sun beats down as lazy rain clouds in the distance roll over beautiful water of countless shades of blue while flora and elegant wooden homes rest peacefully along the inland. The large, white or pastel colored houses shine bright as they are empty to the point of appearing deserted. One after the other I walk by, each house as grand, beautiful and forsaken as the last. I look inland down a road that leads to the beach and still I find nothing. No cars, no people, no stray animals as my gaze returns to the humble rain clouds to the south. 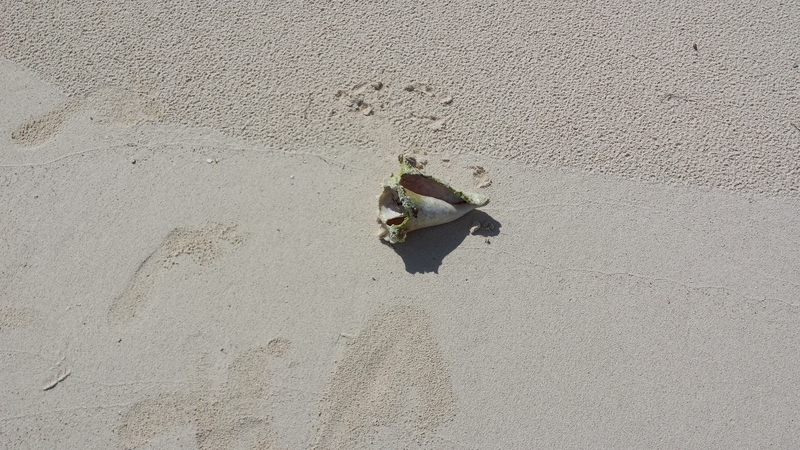 There’s a lone conch shell laying in the sand just ahead. I’ve never felt or even seen one in person. It appears to have fallen from the sky as there are no footprints leading to or away from it. I stand over the shell to sit down, grab and inspect it while facing the sea thinking to myself how serene all of this seems feeling like I may be alone on the island. Out of my view are the signs of civilization, the boats, houses and piers with only a partial view of the shore knowing this is what the beach looked like five hundred, a thousand and even a million years ago. Categories: The Carribean, Wander | Tags: Beach, Caribbean, Cayman Islands, Little Cayman, photography, Solitude, Travel | Permalink.